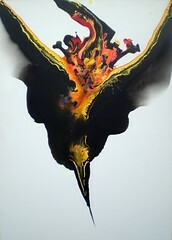 There are two painters that I love, Dali and Richard Mettler. And lucky for me Richard is an Irish based painter so he was naturally on the list. Richards work can be bought directly from him by contacting him through his email address. When looking for my 7 pieces I came up with Richards work immediately. The strong vivid colours could never be replicated in a photo or even on the web. He kindly came to my home and let me take this picture. I am no expert but I couldn’t do it justice. And I hope you realise that there were many photos taken to get you this. Hopefully in the future I will be featuring more of his work, if you are interested in seeing more, please email Richard personally. Richard will soon have his blog up and running and I will have a link to his work. Watch under the Irish Links for Richards name and you can then view more of his work. An on-line shop will then be put in place to buy directly through the blog!